Millennials will outsize the Baby Boom generation and will become the largest living generation sometime soon. The "Millennial generation" refers to the population between the ages of 18 and 34, born in 1980 and later, however no chronological end point has been officially set. They are the first generation to come of age in the new millennium and they are the first natives of the digital age. 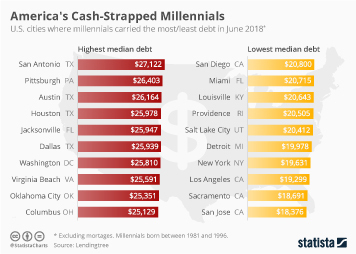 With the first of the Millennial generation now in their thirties and the majority of Millennials beginning their careers, they will be an important engine of the economy in the coming decade. Millennials are social and almost always connected; they spend almost 8 hours a day online. They check email, use social media to keep up with what friends are doing, stream music and movies, shop, play games and more. Social media has penetrated their generation, and popular networks include Facebook, YouTube, Instagram, and Twitter. Millennials are more concerned with their financial future than other generations. They also have high levels of educational attainment. Their largest budget issues include usual issues like rent/mortgage, food, transportation, basic expenses, but also student loans. They put off commitments like marriage, and most of them are renters. Almost 40 percent either live or have lived with their parents due to poor economic conditions. However, when the time is right, they are inclined to buy homes and settle. As Millennials are almost always online, they also shop online. Online shopping product categories include clothing, books, DVDs or music and health and beauty products. However, for cosmetics/personal care items and shoes, Millennials still prefer to shop only in stores. Seventy-four percent of Millennials compare prices online and a remarkable ninety-one percent of Millennials report making a purchase on their mobile device monthly. For Millennials, brand names are not as important as price - not surprising, given their thriftiness. Besides spending most of their time online, Millennials also like to spend their free time with common leisure activities such as reading, spending time with family and friends and exercising/working out. They are also more health conscious than other generations, and buying ‘organic’ is important to them. Topic: Millennials and health in the U.S.
Topic: Generation X in the U.S.